A DEXA Scan is a quick and painless bone density test that can detect early bone loss associated with osteoporosis, before it causes fractures. The test enables us to identify whether you are at risk for fracture by comparing your bone density to your own age group as well as a younger age group. 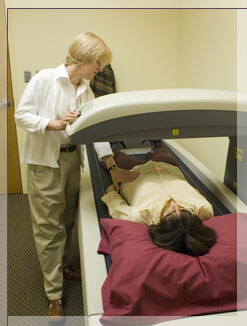 The scan is quick and completely painless, there are no injections, nothing to drink, and you do not have to fast. Typically, a bone densitometry test involves a measurement of your lower spine and both hips, although other areas can or may be scanned. Wear comfortable clothes, preferably without metal zippers or buttons. Do not schedule the test within a week after any test that have required oral or injected contrast. Please do not take calcium supplements on the day of your exam. The test takes about 15 minutes to complete and you can schedule the bone density test to coincide with your mammogram.